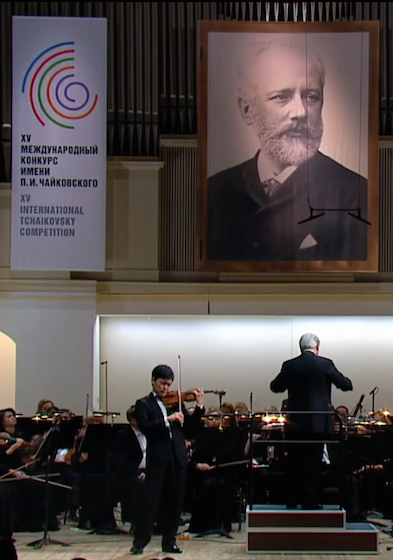 July 15, 2015, 7:44 AM · By now most people know that there was no gold for violinists at the 2015 International Tchaikovsky Competition in Moscow, a fact that has caused some consternation among violinists and fans thereof. But there's one big win that I think we can celebrate: the performances reached a very large global audience, via Medici.tv. 2015 Silver Medalist Yu-Chien "Benny" Tseng. The audience, according to Medici.tv, came from 186 countries, including 12,159 cities, on all continents. The top viewership areas were: Russia: 29%; China & Taiwan: 14%; USA: 13%; Germany: 5%; France: 4%; Ukraine: 3%; Japan: 3%; South Korea: 3%; Canada: 3%; Spain: 2%; and then the rest of the world: 21%. But it's not just the numbers. Medici.tv made the effort to do it right, and this was satisfying to see. Medici came up with an extremely easy-to-use interface and promoted it well through social media. The broadcasts were reliable, with good video and sound. I was also impressed by the bilingual hosts, the many interviews (there are 40 up for replay); the mini-documentaries (some 50 of them) and other content. So kudos to the competition and to Medici.tv for going all-out. The fact that so many people followed these excellent young musicians and became interested in this competition is good news for us all. Vote: Did anyone deserve gold in the Tchaikovsky Competition? July 15, 2015 at 03:26 PM · Yes, great accomplishment for medici.tv. It could have been even better if they did not use proprietary Adobe flash which is pain to install and pain to get rid off. This could put the numbers down a bit. There are better options for video streaming in HTML5 standard. Maybe next time. July 16, 2015 at 11:31 PM · Yes, kudos to MediciTv! Anyone figured out how to download/save the videos? July 17, 2015 at 12:03 AM · You just watch them on Medici, you don't pirate them!